Silver straddles the line between a precious metal and an expensive industrial commodity. The vast majority of gold (over 85%) is used for jewelry and bullion, which makes it rather immune to recessions. Silver, on the other hand, while still used for jewelry and bullion, has industrial uses for its majority demand, so its price tends to decline in recessions when industrial demand diminishes. Silver tends to be more volatile than gold, and in the past few months the price of silver has declined substantially. One method that investors use to evaluate the relative value of silver and gold is by looking at the price ratio between them. 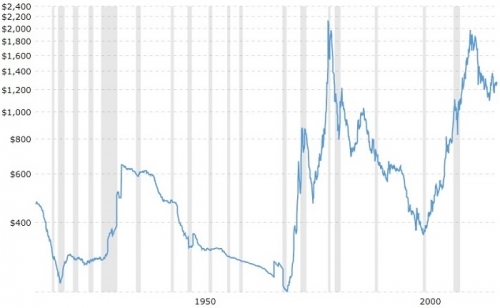 The average price ratio over the past century has been about 50, meaning that gold is 50x more expensive per ounce than silver. And right now, it’s at about 78x. Silver is a lot cheaper compared to gold than normal. Historically, this has been a bullish sign for silver. In antiquity, for thousands of years on multiple continents, the price ratio between the precious metals was between 10x and 20x. 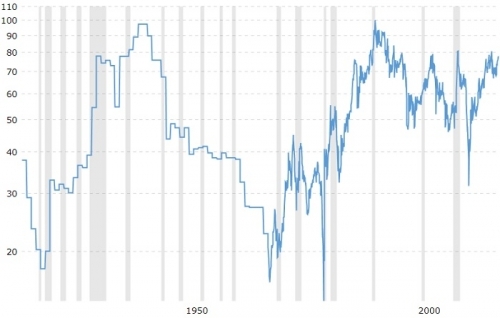 As recently as in the early stages of the United States and during Napoleon’s era in Europe when precious metals were the foundation for currency, the ratio was fixed at 15 to 1. Silver is approximately 20x as abundant in the Earth’s crust as gold, but whereas most of the gold ever mined has been saved, silver tends to get thrown out in the form of electronic waste. It is not nearly as hoarded by central banks and wealthy investors as gold. There’s no fundamental reason why silver should be this inexpensive relative to gold, at only 1/78th the price. Either gold is overvalued, silver is undervalued, or the rational price ratio between them has changed for some fundamental reason. In my opinion, that makes silver not quite a screaming buy, but a solid investment at the current price. 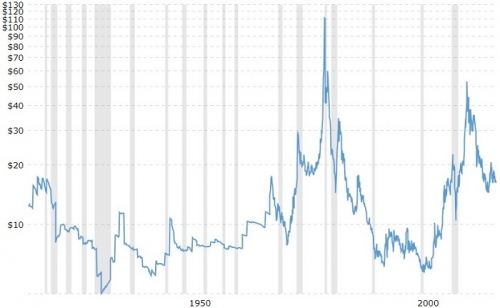 U.S. equities are among the most expensive they’ve ever been in terms of their price to earnings ratios, so if you’re looking to diversify a small part of your portfolio into other asset classes, silver deserves a serious look. The age-old problem of investing in precious metals is that they don’t produce cash flow. Without cash flow, how do you value them? And without cash flow, they can’t pay investors dividends. In theory, they only increase in price over time due to inflation or because they shift in between an overvalued and undervalued state. Plus, there is an expense associated with investing in precious metals. If you invest in physical metals, you have to pay for verification, shipping, and security. If you invest in a precious metals ETF, you have to pay an expense ratio for their administration and security expenses. A decent way to deal with those problems is to sell options on precious metals ETFs to generate income. Right now, for example, you can sell cash-secured put options on the iShares Silver Trust ETF (SLV) to get paid to wait to buy it if it dips lower. As of this writing, SLV is trading for $15.33. If you sell a put for a strike price of $15 with an expiration date of January 19, 2018, you can get paid an option premium of $0.59/share. Outcome 1) Silver will drop in price, and you’ll buy shares of SLV at a cost basis of $14.41, which is the strike price minus the premium earned. You can then sell covered calls on it at a higher strike price (perhaps $16 or $17), to get paid until you can eventually sell it at a higher price. Outcome 2) Shares of SLV will stay above $15, in which case you’ll get to keep your premium, which is approximately a 4% rate of return in 5 months. That’s almost 10% annualized returns just from silver staying flat, going up, or even going slightly down. The taxes on those gains will be deferred until 2019, assuming it’s a taxable account. The numbers will differ over time, but as long as silver is reasonably priced, this is a useful strategy for a few reasons. For one, it avoids the age-old problem of precious metals not producing cash flow. In this case, you literally get paid to wait to buy silver, and once you own it, you can sell covered calls on it to generate “dividends” on your shares of silver until you can sell it for higher than you bought it. Two, it provides diversification. Most portfolios just have stocks, bonds, and cash. It’s good to be in all of those asset classes, but also REITs, MLPs, and a small dip in precious metals. Maybe physical real estate or cryptocurrencies as well, if that’s your thing. Three, although precious metals are volatile, they’re real. Cash is devoid of value itself, but based on a promise, and produces very low returns in our current low interest rate environment. Precious metals are inherently rare, and have thousands of years of usage as currencies. And with options, you can generate much higher income than on interest in a bank account. There are, of course, a few downsides to this approach. It’s a patient investor’s game, not a hot speculation. You can’t really make a ton of money at once, since your upside is capped. It’s a slow, steady, income-generating technique to regularly buy on dips, sell on spikes, and get paid all the while. And there’s always the possibility that the price of silver could drop dramatically for some reason. If you sell a cash-secured put option on something, you have to be willing to buy it at the strike price. If you believe silver is reasonably valued currently, then it’s a smart move. If it drops much lower, that would put it into clearly undervalued territory, and worthy of additional investment. Because it generates option premiums which are taxed at ordinary tax rates, it’s not very tax efficient. It’s a great strategy for a Roth IRA for that reason. Overall, it’s a novel way to invest a small portion of your portfolio into precious metals, and right now, a number of metrics indicate that silver is mildly undervalued or at least reasonably priced. Disclosure: The author is long SLV.